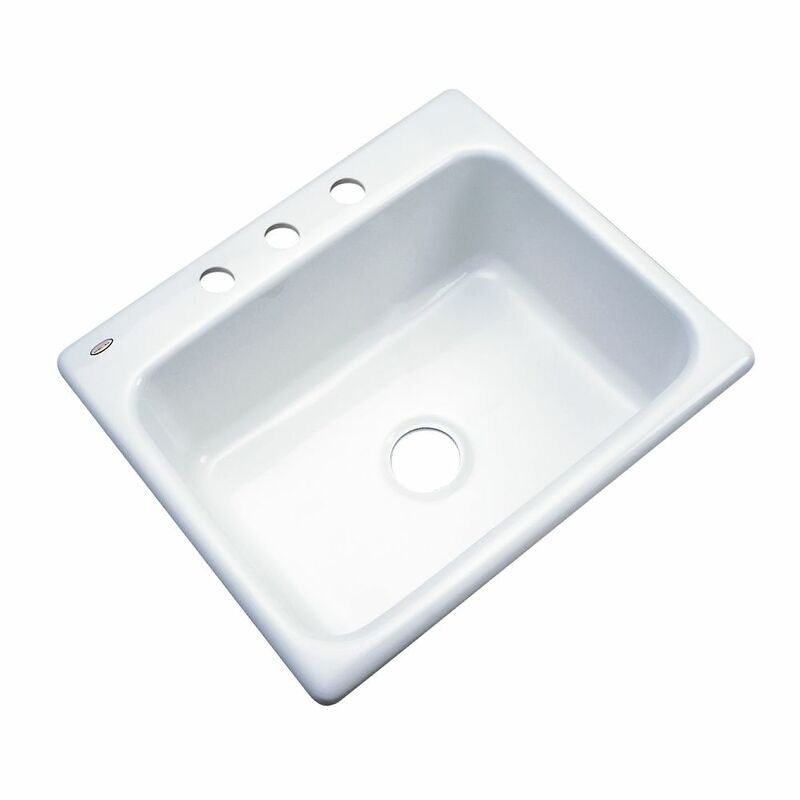 Inverness 25 Inch Single Bowl White Kitchen Sink is rated 4.1 out of 5 by 10. Rated 4 out of 5 by macley from Love my new sink Nice white color, easy to clean, really stands out in my new kitchen. Great quality and price. Rated 5 out of 5 by Janny from Love my sink A stainless sink in my small kitchen was nearly an eyesore. I replalced with this sink and it's a different kitchen. Best of all, no more harsh cleaners to keep it pristine! Kudos to the installer - he did a fantastic job. Rated 5 out of 5 by jpdimrist from So far so good! This sink was undermounted with my new granite countertops, and it looks great! After about a month of use, there are no scratches or stains, and all I have done is rinse it so far. Also, I love having a single, big sink instead of a double sink. Rated 5 out of 5 by Bobbie from Good quality, Looks Great! We purchased this sink to use in our laundry room in a 36" sink base cabinet. Plenty deep enough to soak cloths in and the gloss finish looks great. The same price as a dull grey laundry sink and looks so much better. Rated 4 out of 5 by Rexy from Just what we were looking for at this price. Our only criteria to replace our old kitchen sink was that it had to be the same size (small) and not stainless steel. This sink did the trick! We've only had it a little while, but so far it has been just what we were looking for at just the right price. I was worried about scratching, but that has not been an issue so far. Rated 4 out of 5 by Manager from Good product, good performance We have used this model sink in our housing property for serveral years with good results. Only one return for damage in about 40 units. Good useful life for the price. Rated 4 out of 5 by homeboy from good product, easy install I like the sink very well, good material, workmanship. The only complaint is there is just 1/4 inch base to glue the sink to the counter top. It would have been better to have at least 1/2 inch of surface for a better bond.